I was recently sent a (very nice) package by MS&L that contained the latest air freshening scent from Febreze: Thai Dragon Fruit. Febreze claims that their technology allows the air freshener to “sweep away odors”, but I’m not really sure how that would work. I do know that Febreze Air Effects come in ergonomic bottle with an easy-to-use trigger, they smell nice and light without being cloying, and inhaling the resulting mist will make you cough and leave a funny taste in the back of your throat. The point of all that is to say, I don’t think dragon fruit have a very pronounced scent. 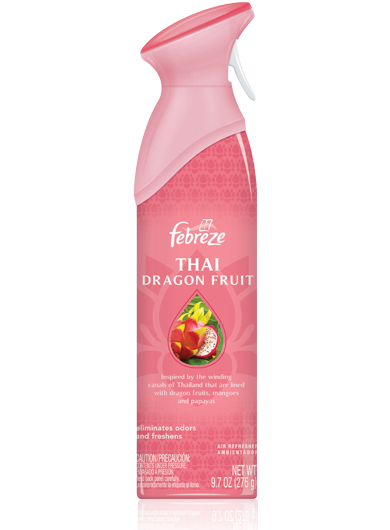 Therefore, I can’t really say the Febreze scent is similar to dragon fruit (you know, in case you were looking for something that would make your house smell like a dragon fruit harvest). But, it does smell nice – lightly sweet and fruity. We keep it in the bathroom since that’s where most, you know, smells are, but it’s in the bathroom I don’t use. We tested it in the kitchen because that’s where we were when I opened the box, but I don’t keep air fresheners in the kitchen typically. I don’t like food scents to mingle with non-food scents. I’d consider keeping it in the dog room, but I’m afraid I would just be constantly spraying Febreze everywhere and that doesn’t seem very efficient. I will say I’ve been impressed with the latest scents Febreze has been coming out with. I used to use the original Febreze all the time, and then I got sick of the smell (I could even tell if someone else had been using Febreze in their house) and stopped. But, now that they smell lovely, I’m willing to give them a spray here and there.